iPhone owners who previously made use of the Personal Hotspot feature on wireless networks that do not support it are now out of luck, after changes in iOS 7.1 have disabled the ability to manually edit tethering settings for unauthorized carriers. Unhappy users have taken to Apple's support forums to grouse about the issue in a thread that now boasts nearly 16,000 views and over 200 individual replies. Users from the U.S., the U.K., the Netherlands, Estonia, Italy, and Sweden, among others, have chimed in to say that their tethering ability was immediately deactivated upon upgrading to the latest revision of Apple's mobile operating system. 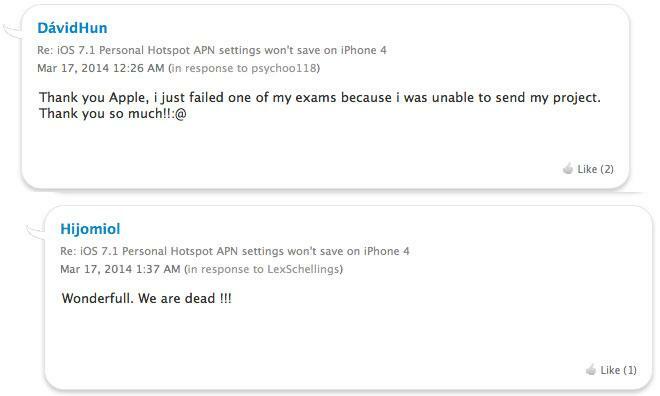 According to the reports, any changes made to the APN settings for Personal Hotspot are not saved once the user backs out of the Settings app. The problem has been spotted in every iOS 7-compatible iPhone generation including the flagship iPhone 5s, and was initially blamed on a software glitch. Subsequent testing and conversations between forum users and Apple support agents, however, appear to have narrowed the issue down to a lack of carrier authorization. Users with carriers that support Personal Hotspot have reported a smooth experience, while those who previously experienced the issue and then swapped their SIM card with one from an authorized carrier have seen the problem disappear. Some users whose carrier does allow tethering but does not have a current partner agreement with Apple may have been inadvertently affected by the changes. Most, however, appear to have been abusing the function enable Personal Hotspot without paying additional fees. Unauthorized tethering has been a source of friction between iPhone users and wireless service providers since day one. After Apple's deal with AT&T secured flat-rate unlimited data plans for buyers of the first-generation iPhone, the carrier fought a cat-and-mouse battle with users of unauthorized tethering apps until officially supporting the feature three years later.